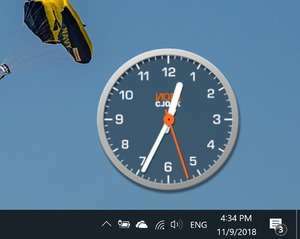 NovaClock is a highly customizable clock to which you can add a bitmap face, clock hands, slices, shadows or text or add features to existing skins. All elements of the clock can have different transparency levels and transparent PNG files can be used. Set your clock to be transparent for your mouse clicks but always visible and never freezing. The coolest clock out there. Version 2.0.0.14 is a freeware program which does not have restrictions and it's free so it doesn't cost anything. For security reasons, you should also check out the NovaClock download at LO4D.com which includes virus and malware tests. Additional screenshots of this application download may be available, too. NovaClock has a presence on social networks.